MicroBooNE is the first large liquid-argon time projection chamber (LArTPC) to acquire a high statistics sample of neutrino interactions. With its superb capabilities in tracking, vertexing, calorimetry, and particle identification with full electronic readout, MicroBooNE represents a major advance in detector technology for neutrino physics in the energy regime of most importance for elucidating oscillation phenomena. These capabilities lead to objectives that combine immediate scientific interests with long-term technological innovations. The experiment primary scientific objectives are to to resolve the source of the MiniBooNE low energy excess, to measure a suite of neutrino cross sections, to search for astrophysical phenomena and exotics. MicroBooNE is currently supernovae live, when a SNEWS alert is received, data will be saved to study neutrino bursts from supernova. Another important objective of MicroBooNE lies in the area of detector development. MicroBooNE will provide enormous technical experience in the construction, operation, and analysis of a large LArTPC. This experience will directly inform the design of very large LArTPC detectors envisioned for DUNE and beyond. The MiniBooNE experiment performed a short baseline search for the νμ→νe oscillation signature suggested by the Liquid Scintillator Neutrino Detector (LSND). MiniBooNE observed an unexpected >3σ (statistical and systematic combined) excess of neutrino interactions producing final state electrons or photons at lower energies. This result generated substantial theoretical interest. Proposed explanations for the source of these events predict either a single electron track or a single photon produced at the neutrino interaction vertex. MiniBooNE cannot discriminate between these two possibilities, as Cherenkov detectors cannot distinguish an electron from a photon converting near the interaction point. If in fact the anomalous MiniBooNE events signal true electrons from νe charged current interactions, explanations from theorists suggest a beyond the Standard Model interpretation. For example, one model proposes that instead of MiniBooNE observing electron neutrino appearance, the low energy excess results from intrinsic electron neutrinos from the beam that disappear at higher energies (Phys. Rev. D82:093016, 2010). This interpretation, combined with recent results from reactor antineutrino experiments, fits well with a model involving oscillations to sterile neutrinos (3+1 model) where the null hypothesis is disfavored at 99.93% CL (arXiv:1101.2755). MicroBooNE runs in neutrino mode where MiniBooNE observed the excess. MicroBooNE operates in the MiniBooNE neutrino beamline configuration and at nearly the same baseline distance allowing tests of models that predict a dependence of the MiniBooNE excess on the distance from neutrino source to detector. MicroBooNE employs the LArTPC detector to provide excellent electron/photon discrimination. MicroBooNE’s data taking run will last long enough to provide sensitivity to a MiniBooNE-type signal at the 3 to 5 σ level for the predicted excess above background. MicroBooNE expectations for resolving the MiniBooNE low energy excess. The MicroBooNE analysis is performed under two assumptions: that the low energy excess is due to an electron-like event (left); and that the low energy excess is due to a photon-like event (right). Stacked histograms show the expected backgrounds. Error bars indicate statistical uncertainty. The number of signal events, scaled from MiniBooNE for neutrino flux and fiducial volume, is the same in both plots. Both plots assume 6.6 x 1020 POT for the MicroBooNE 60 t fiducial mass. The MicroBooNE analysis will proceed in two modes, one that assumes that an electron interaction produces the signal (electron-like analysis) and the other that assumes a photon interaction generates the signal (photon-like analysis). Electrons distinguish themselves from photon conversions to an e+e– pair by their different apparent ionization rate at the beginning of their trajectory. Put simply, an e+e– pair ionizes at twice the rate of a single electron. As can be seen from the MiniBooNE example, photon misidentification backgrounds limit Cherenkov radiation-based detectors. MicroBooNE goal is to lower the background and have more detection efficiency in order to have an oscillation sensitivity come favourable to that of MiniBooNE despite MicroBooNE having five times less detector mass. MicroBooNE proposes to make the first measurement of exclusive final states from neutrino scattering on argon. Sufficient statistics to reduce statistical uncertainties to the same order as systematic effect for rare processes. These four features constitute the design drivers for the MicroBooNE detector that arise from the cross section physics. MicroBooNE is carrying out an extensive cross section physics program that will help to probe current theories on neutrino-nucleon interactions and nuclear effects. Cross section measurements will also be relevant for oscillation analyses. MicroBooNE can measure the elastic scattering cross section ratio σ(νμp→νμp)/σ(νμn→μ–p). When combined with polarized electron-proton/deuterium cross section measurements, this ratio allows a determination of Δs, the fraction of the nucleon spin carried by strange quarks. Measuring this ratio at low values of Q2 gives MicroBooNE the potential to improve the determination of the value of Δs by almost an order of magnitude in global fits of strange form factors. Dark matter searches require better knowledge of Δs, with the current uncertainty on this quantity limiting the sensitivity of many such searches. Coherent pion production in neutral current (NC) and charged current (CC) events provides a second set of cross section measurement that highlight the value of high resolution and clean reconstruction of nucleons in MicroBooNE. 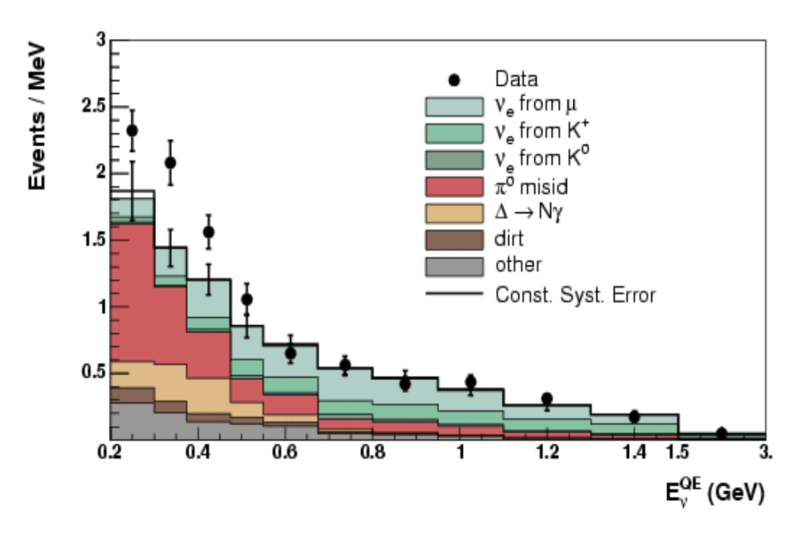 A K2K analysis suggests that very little coherent CC π+ production, a result confirmed by SciBooNE measurement. From a theoretical point of view this observation does not harmonize with the larger coherent NC π0 signal reported by MiniBooNE. Two features characterize coherent neutrino-nucleus interactions, a sharply forward-scattered final state lepton and pion, and the absence of debris from nuclear breakup. MicroBooNE provides both excellent forward angle resolution and high sensitivity for observation of protons and de-excitation photons produced in non-coherent processes. Measurement of kaon production by neutrinos addresses two important issues. First, a study of these events should prove to be directly relevant to future proton decay measurements by multi-kton LArTPCs in the p→K+ν decay channel. Kaons produced in MicroBooNE lie in the same energy range as those that would be produced via p→K+ν. Examining these kaons in MicroBooNE will thus improve the background estimates for future proton decay experiments in this mode. Second, kaon production provides a nice test of reconstructing complicated topologies (the K→π→μ→e decay chain), a design-driver for the experiment. MicroBooNE could demonstrate that photons and not electrons produce the MiniBooNE low energy excess. In this case, one could then conclude that νe production is well understood at low energies where the flux is dominated by muon decay. This would allow MicroBooNE to make the first measurement of the νe cross section in the 0.1-1.0 GeV energy range, an important measurement for precision long-baseline neutrino oscillation studies. MicroBooNE surface location limits its palette of non-accelerator neutrino physics topics. This siting reflects a conscious design decision to focus on beam related physics, and not to expand the design in a substantial way to incorporate non-accelerator physics. One exciting non-accelerator physics topic open to the experiment with only modest expansion to its design is supernova (SN) detection through a short pulse of neutrino interactions observed in the detector. If a supernova were to occur in our galaxy, MicroBooNE would detect more events than were observed, in total, from SN 1987a. Moreover, because these SN events produce electrons in the >10 MeV range, the design requirements on MicroBooNE do not substantially extend beyond those already in place for collecting a substantial muon decay electron sample for energy calibration studies. In the process of seeking this physics, MicroBooNE addresses several technical issues for future detectors.